A big part of keeping cost down, minimizing time and upping your ability to stick to the plan… is, well, planning. If you fail to plan, you plan to fail. That’s actually pretty accurate… especially when it comes to converting to clean eating. Thus far, we’ve toyed with cutting fast food, upping the water intake, cooking dinner every night (processed or not)… but now, it’s crunch time. It’s time to get down to business. Before I hit the grocery, I make a chart like this for myself as well as my little one. I can see, visually, what we’ll be eating throughout the week. Some things will be consistent – like, for example, my daughter eats an apple and a pear for a snack each day, or she’ll eat some cereal for breakfast – and some things, like dinner, are very different each night… especially if you’re like me and you like to try any and every random recipe you get your hands on. Then again, the problem with trying any and every recipe you can get your hands on, is the number of times you may wind up going back and forth to the grocery. Hence… why you plan in advance. You do a little recipe shopping, write down the ingredients you’ll need for each recipe on the back of your chart, go to your kitchen and cross off the things you have… and everything else? Well, that’s your shopping list for the week! Meet your new best friend (downloadable PDF file). Download and print off the chart, then plot out your week. Keep in mind portion sizes (and allowances), what your recipes call for as well as expected cost for each item. Don’t be afraid to scrap a recipe if the ingredients cost too much. We’re going to spend this week talking about that grocery list and, while I won’t tell anyone what they should eat (beyond just tons of fruits and veggies, of course), I’ll definitely point out things to avoid. It’ll be a fun one, that’s for sure! Now this right here is what I don’t do and I know that that not planning is self-defeating. Thank you once again for a very practical way to get on top of this healthier living “thing”. Fantastic!! Thanks for sharing! I have already lost 2 kg since following your blog and appyling your recommendations. YAY!! Now shopping w/a plan will slim down my behind and fatten up my wallet hopefully! I eat healthy most times, but a bigger concern for me was saving money on groceries (coupons only go so far) and cutting down on meal prep. 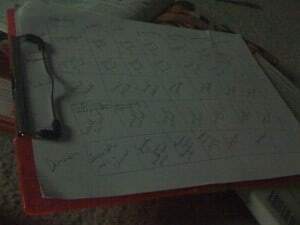 So I’m pretty inspired and excited by the chart, I think it will help me plan ahead better. I already printed a few copies and currently working on planning meals for the rest of the week. Great idea! I’ve tried a printable chart like this before but this looks like something I can use in conjunction to after school snacks and snacks for myself. Thanks. Love this chart!!! it helps a great deal. Oh and I love your site…thank God for twitter!! This is genius!!! 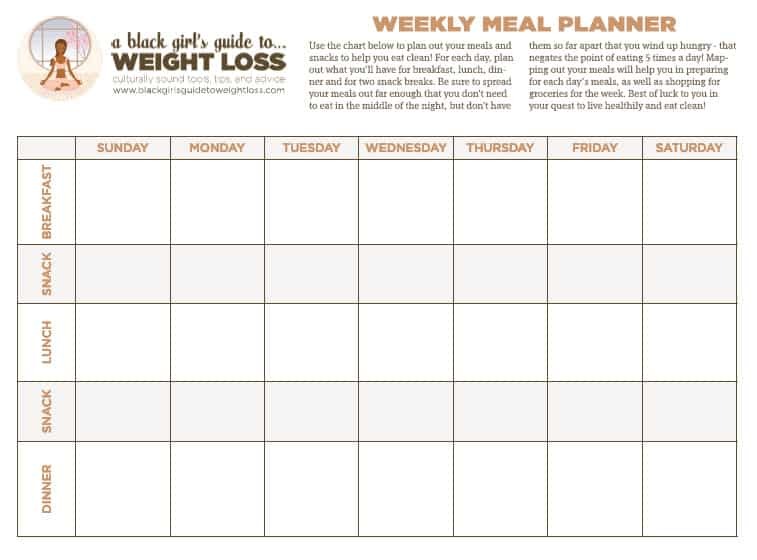 I too plan out my meals but this is a perfect way on how to visualize what you’re eating for the week! I’m on WW so I’m going to use his chart to include my food points as well. Thank you! I absolutely love your site! I just stumbled upon it in a google search. I’ve been mostly eating clean and working out for a few months now and I can already see and feel a huge difference in my body. I’m looking forward to adding some of your recipes to my repertoire and using this chart to better plan my hectic schedule and cut out the processed snacks I’ve been eating between work and school. You. Are. Awesome! I just had to say that. It’s so simple I could kick myself for not doing this before. Anyway – thanks!